This page will walk through Spring Boot Security REST + JPA + Hibernate + MySQL CRUD example. When we create application using Spring Boot, we have to write only few lines of code to include a feature such as web, security and database connectivity. If Spring Boot gets Spring Security in classpath, then it will automatically performs security related configurations. In the same way if Spring Boot gets Spring Web and Spring Data in its classpath then Spring Boot automatically performs Spring Web and database connectivity related configurations. In the case of Spring Security, Spring Boot configures in-memory authentication by default with a single user and random password which changes after every server restart. We can get default password printed in console. In our example we will save user authentication related data in database, so we have to override the Spring Boot default security configuration. We will create a security configuration file annotated with @Configuration and @EnableWebSecurity. To override the HttpSecurity, our security configuration class needs to extend WebSecurityConfigurerAdapter class and override the configure() method. To enable method level security, annotate security configuration class with @EnableGlobalMethodSecurity. To authenticate and authorize a user using database, we need to implement UserDetailsService interface. We will handle CREATE, READ, UPDATE and DELETE (CRUD) operation in our REST web service example. Let us discuss the complete example step by step. Find the software used in the example. If spring security is in the classpath then our spring boot web applications are automatically secured by default using basic authentication. A default username as 'user' and random password that will be displayed in console when server starts, can be used for login authentication. The password is printed in console as follows. The above password is random and changes when server is restarted. By default spring uses in-memory authentication with single user named as 'user'. Find some configurations. 1. To enable spring security in spring boot application just use the following spring-boot in maven or gradle file. 2. To change default password, spring boot provides security.user.password property that needs to be configured in application.properties as given below. 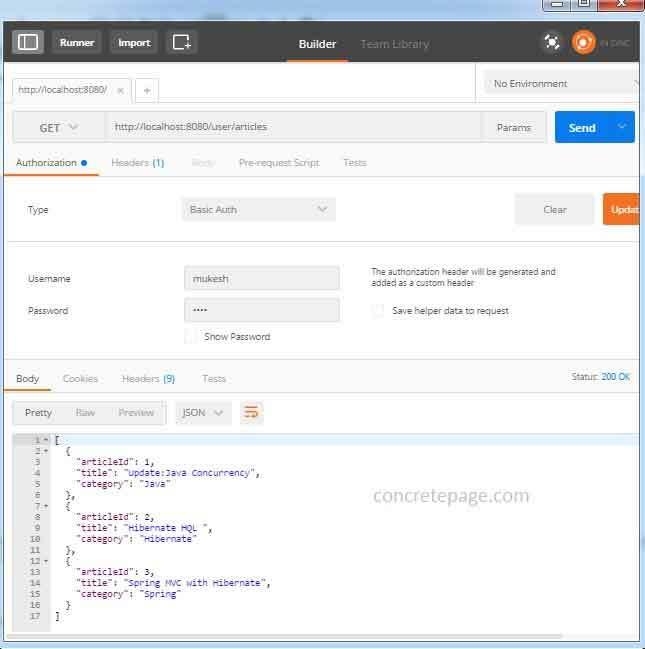 Now we can login application using user/concretepage credential. Other security properties can also be changed via SecurityProperties using the security. * prefix in application.properties as given below. security.basic.enabled: It enables basic authentication. Default value is true. security.basic.path: It configures paths to apply security. We need to provide comma separated paths. security.enable-csrf: It enables CSRF. Default value is false. security.require-ssl: It enables and disables SSL. Default value is false. security.sessions: Default value is stateless. Values can be always, never, if_required, stateless. security.user.name: It configures user name. Default user is user. security.user.role: It configures role. Default role is USER. 3. If we have fine-tuned our logging configuration then to print default random password, we need to configure following property in application.properties with INFO level. 4. By default static paths are not secured such as /css/**, /js/**, /images/**, /webjars/** and **/favicon.ico. 5. The features such as HSTS, XSS, CSRF, caching are provided by default in spring security. Above properties can be switched on and off using security. * but if we want to use username and password in database then we need to use UserDetailsService. To control security related configuration, we can create a security configuration class that will extend WebSecurityConfigurerAdapter then override configure() method . This class will be annotated with @Configuration and @EnableWebSecurity. If we want to enable method level security, the class will be annotated with @EnableGlobalMethodSecurity . Find the maven file used in the example. When the Spring Boot application finds any JAR in the classpath, then Spring Boot automatically configures required settings. spring-boot-starter-web: Configures web application settings automatically. spring-boot-starter-security: Configures security related settings automatically. spring-boot-starter-data-jpa: Configures database connectivity related settings automatically. In spring boot, to configure database related properties, hibernate and logging, we need to use application.properties or application.yml. These files are automatically read by Spring Boot. Use spring.datasource. * to configure datasource related properties. Use spring.jpa.properties. * to configure JPA related properties. Here in our example we are using JPA with hibernate. Find the MySQL database schema. We have two tables users and articles. In the users table we keep information related to a user and in articles table we keep information related to articles. We are using BCrypt password encoding scheme. Find a simple main class that can be used to generate BCrypt password. For the given two tables in the above database schema, find the java entity. In our example, we are not using Spring Boot default in-memory authentication. We will store user authentication related information in MySQL database and access them using Hibernate. So we are creating a DAO method that return user information for a given user name. The role of Spring @Transactional annotation is to make DAO methods transactional. We are using JPA API for database transaction and hence we will instantiate EntityManager using dependency injection. To achieve it create EntityManager property annotated with @PersistenceContext. Spring provides UserDetailsService that authenticate and authorize user. It receives user related data from our DAO. In our example we are using header based authentication. When we are not using login page based authentication, then for any request to application, Spring needs to send an error with a proper status code. Spring provides BasicAuthenticationEntryPoint that needs be implemented to achieve it. It has a method commence() that we will override and return a status code (401) unauthorized with header containing authentication type required for authentication. In our example we are using basic authentication. Now we will create security configuration file. The class has been annotated with @EnableWebSecurity that configures spring security from the class WebSecurityConfigurer. If we want to override any method of WebSecurityConfigurer then we extend WebSecurityConfigurerAdapter. In our example to configure HttpSecurity we have overridden configure() method. Here we have authorized a URL with /user/** pattern. We will also configure implementation class of BasicAuthenticationEntryPoint here. Now autowire method configureGlobal() within which we configure implementation class of UserDetailsService with BCryptPasswordEncoder encoding scheme. To secure service methods we need to use @EnableGlobalMethodSecurity annotation. To enable method level security with @Secured annotation, configure securedEnabled metadata with value true. To enable @PreAuthorize and @PostAuthorize annotation, configure prePostEnabled metadata with value true. 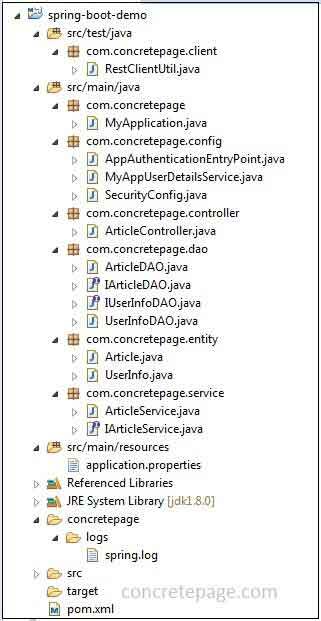 Find the DAO class for CRUD operation using JPA EntityManager. Now we will create service methods for CRUD operation with secured methods. All the methods can be accessed by the user with the role ADMIN. User with the role USER can access only getAllArticles() and getArticleById() service methods. Now find the implementation class. Find the controller class that has methods for CREATE, READ, UPDATE and DELETE (CRUD) operation. We have created following URLS for CRUD operation. Create a class with main() method that will call SpringApplication.run() to run the application. First all JAR dependencies are downloaded and then the project is compiled and then embedded tomcat server starts. We need to annotate this class with @SpringBootApplication annotation that is equivalent to @Configuration, @EnableAutoConfiguration and @ComponentScan annotations. To consume the REST web service, we are using RestTemplate. For authentication we will pass Base64 encoded credential as username:password token in HttpHeaders with Basic authorization. Here we are performing create, read, update and delete (CRUD) operation. We can test the application using credentials mukesh/m123 with ADMIN role and tarun/t123 with USER role. To run the application, first create table in MySQL as given in the example. Now we can run REST web service in following ways. 1. Using Eclipse: Download the project source code using the download link given at the end of page. Import the project into eclipse. Using command prompt, go to the root folder of the project and run. and then refresh the project in eclipse. Run Main class MyApplication by clicking Run as -> Java Application. Tomcat server will be started. 2. Using Maven Command: Download the project source code. Go to the root folder of the project using command prompt and run the command. Now we are ready to test the application. To run client, go to the RestClientUtil class in eclipse and click on Run as -> Java Application. We can also test application using Postman UI. Find the print screen. I am done now. Happy Spring Boot learning!